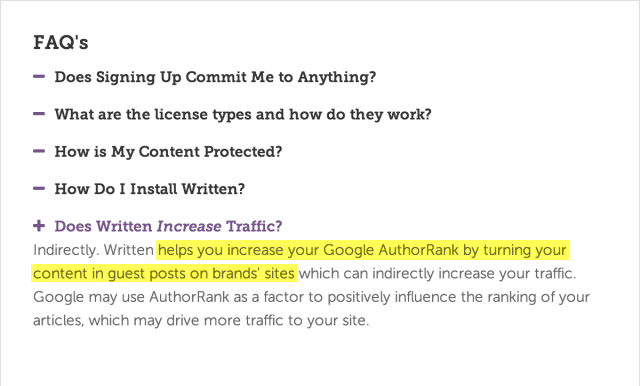 On one of Written's pages, they have this nugget: "This license allows the brand to reprint the content on the brand's blog but does not move traffic. Written.com ensures proper attribution including a rel=canonical tag which ensures that search engines perceive the licensed copy as a syndicated copy." When they say the licensed copy, do they mean the copy that appeared on the original publishers site? And if so, do you think Google would ignore this tag if the content was republished on domains repping DA's of 80 and above? If they are "delivering the audience" to the brand licensing the content, that would suggest the rel=canonical flows into the branded site. so they are absolutely giving themselves the ability to both canicalize & 301 the existing link equity from the blogger's blog post to point it into the brand advertiser's pages. 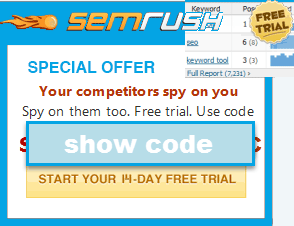 Pretty risky combining both bulk guest posts & a paid link network so overtly. Interesting article, Aaron. Thanks for being one of the few SEO commentators out there bringing the truth and being willing to criticize Google and their double standards. Well at least MBG can still "pay" for traffic from Google, I'd be curious as to how much Google nets for each site they torch. It seems from the begining that Guest blogging won't last for long as it was abused, and people publish nonsense for the sake of a link. ,And Google hates this, and it decided to soffocate it, as it did with article submission. Hasn't Google created these problems? I read somewhere that less than half of the world's 7 Billion people are online currently. Of those 3 1/2 billion people online how many actually search for something using a search engine versus using a supplied link (which could be in an email, on a social site, or a site you frequent, in a guest post, and so on)? Factor in that Google gets about 70% of all searches in the USA and the important words are 'All Searches' not all users. Most 'guest bloggers' are writing what I would call a lead in article that has links directing the READER not search engines to the full article most likely on their site. Google wants 'unique' content and thus this 'guest blogger' that wrote both an excellent article and lead in article now has to spin the lead in article for distribution which of course destroys its quality and can make it impossible for the reader to understand. If Google were to drop their nonsense of uniqueness and not penalize a 'guest blogging' site for having duplicate content I believe the quality would rise, and the reader would be better served. Afterall it is poor thinking to assume that every reader visits every website just to read each 'guest blog post', so why not allow quality lead in articles that are identical on different blogs as they most likely do not get the same visitors / readers on each. 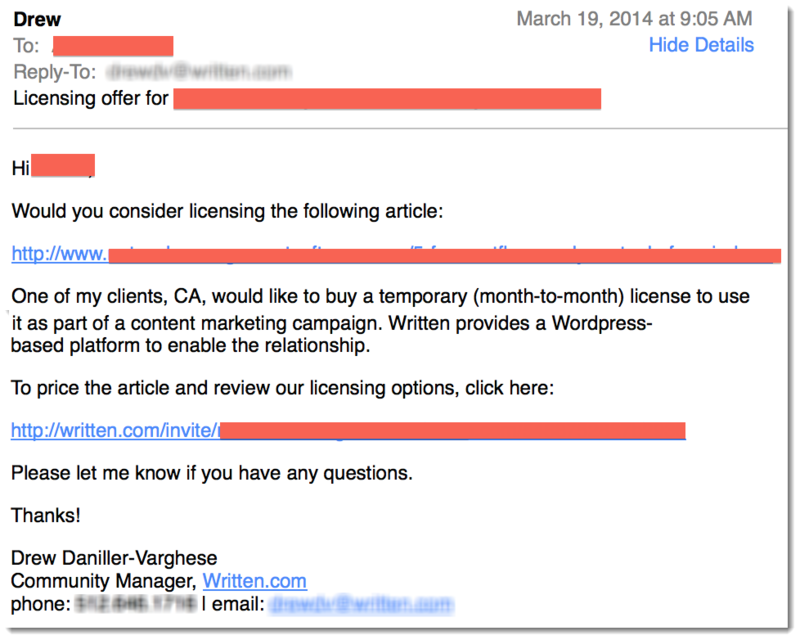 Hey Aaron - I'm a longtime reader of seobook and with respect to you and your work, I wanted to clarify a few details about Written. I'm happy to answer any questions you have about Written. You can email me at josh@written.com or call my mobile 512-524-7755. ...I'm not a programmer, but a friend who looked at the plugin for bloggers said it looked like the 301s may have flown in the other direction to where the bloggers link equity is 301ed into the brand site which is syndicating the content. Are you suggesting the bloggers never have their articles 301ed to the brand sites?